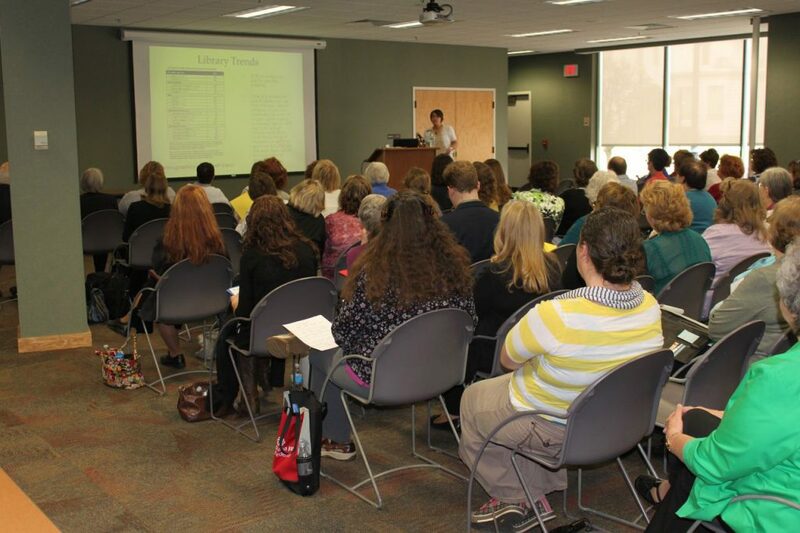 The library’s meeting rooms provide space for programs and activities either sponsored by the library, community groups, or individuals for cultural, educational, informational, recreational, or civic purposes. Any person or group interested in using a meeting room must Request a Room in our online [spaces] software or at the library. A library staff member will review the request, determine if the proposed meeting falls within library policy and contact you. Please review the Meeting Room Policy and Fee Schedule for usage guidelines and applicable fees. The Large & Small Meeting Rooms can be combined together to make one large room or divided in two, with a separator wall. Tables and chairs can be easily rearranged to fit the needs of your meeting or event. Seating Capacity: when combined the room seats 378 people with chairs only. The largest portion of the Meeting Room can be rented by itself and rearranged for meetings or informal parties. 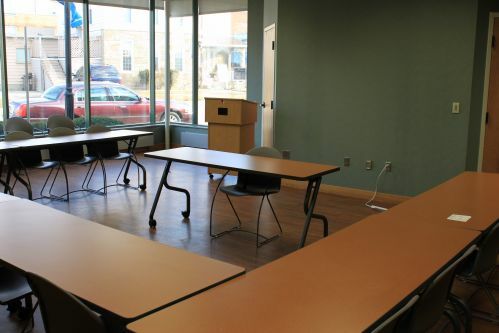 The room is equipped with a sound system, microphones, a multi-media projector, standard audio-visual equipment, public Internet access, and a marker board. A kitchenette is attached to the Large Meeting Room and can be rented for an additional cost. 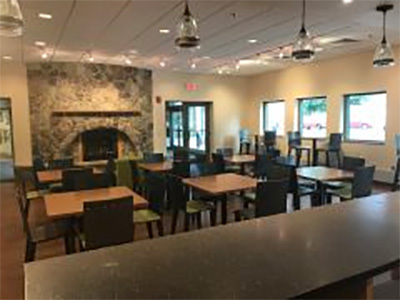 The kitchenette offers a window overlooking the room, a sink, microwave, refrigerator, coffee pot, and many standard utensils that can be used for your event. Seating Capacity: 72 people with tables and chairs; 250 people with chairs only. The smallest portion of the Meeting Room can be rented by itself and is equipped with all the same features as the Large Meeting Room. 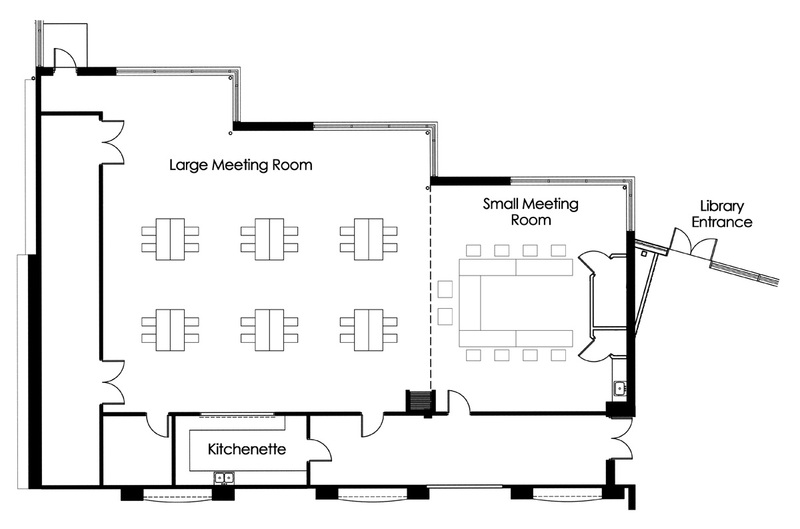 While the kitchenette is not directly attached to the Small Meeting Room it can be rented for an additional cost. Seating Capacity: 24 people with tables and chairs, 49 people with chairs only. This cozy meeting space with a fireplace can be rearranged for your event. Attached to the space is a full-equipped kitchen with a countertop/bar area, stove, sink, microwave, refrigerator, and access to standard utensils. Seating Capacity: 24 people with tables and chairs; 49 people with chairs only. 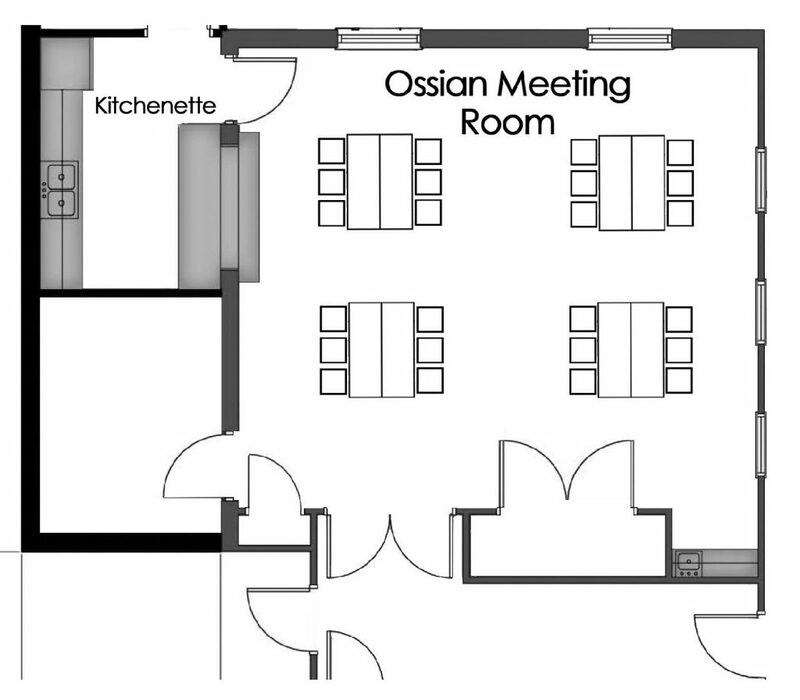 The Ossian Branch Library has one meeting room that can be rearranged for meetings and events. The room is equipped with a multi-media projector, table top podium, CD/Cassette Tape Recorder, VCR/DVD unit, public Internet access*, and marker board easel. An attached kitchenette offers a window overlooking the room, a sink, microwave, refrigerator, coffee pot, and many standard utensils that can be used for your event. Seating Capacity: 24 people with tables and chairs; 36 people with chairs only. The library director or branch manager must approve all exceptions. Prevailing sales tax will be charged to for-profit organizations and individuals. Not-for-profit organizations must provide a copy of Form ST-105 (Indiana Department of Revenue General Sales Tax Exemption Certificate) each year. Full payment is expected at the time of reservation in order to hold the event. Payment will be fully refunded for cancellation if notification is received at least 30 days prior to the date of the event. If the event is canceled with less than 30 days’ notice, payment will be forfeited. Groups failing to vacate the meeting rooms by the time specified on the application form, without permission from the library director, are charged an extra fee of $100.00 and further use of the meeting rooms will be denied. If permission is given by the library director to extend the hours, the normal fee schedule applies. Each group assumes full responsibility for any damages incurred from the use of the meeting room. Abuse of the facilities will be sufficient cause to deny further use. A bill will be sent to the group representative for any damage caused by the organization using the facilities. Compensation base on replacement cost, labor cost, or both is received within 30 days. Click on Request a Room and then “Search for a space” based on the date and time you’d like. 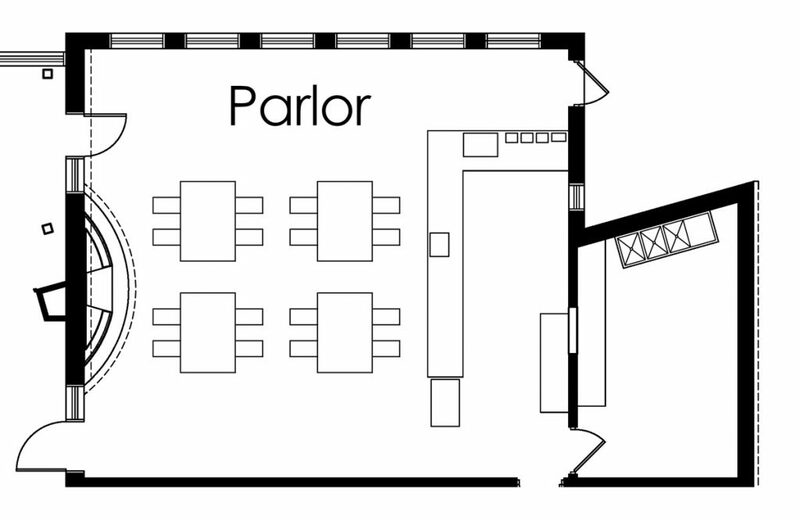 Narrow the room search by either the location (Main Library or Ossian Branch) or the equipment that you need for your meeting or event. All rooms available at that time that meet your needs will be in green. To submit a request to reserve a space, just click “Pick Me” next to the room that you’d like. If you haven’t created an account in our [spaces] software, you’ll need to do that or you can simply log-in. Once we receive your request, our library staff will review it and be in contact with you. Your space will not be officially reserved until we contact you and obtain payment. If you’d prefer to print out an application and bring it into the Main Library or Ossian Branch, you can do that as well. The Meeting Room Application for both locations are listed below. Contact Dawn Miller at (260) 824-1612 or dmiller@wellscolibrary.org. Contact Susan Dailey at (260) 622-4691 or sdailey@wellscolibrary.org.